Weekly Review - technicals dicey, will earnings save us or bury us? Well, there was no Obama rally last week despite all the hooplah over the inauguration. On the contrary, markets dived several more percent. Interestingly, the U.S. market was somewhat spooked by international happenings this week. The situation with banks and their need for bail-outs in the U.K. sent chills down the backs of U.S. investors. Nationalization became a hot blog topic and U.S. financial stocks went into a tailspin. The fact that most U.S. banks reporting earnings this week revealed still more writedowns and ever higher loan loss reserves certainly didn't help sentiment in the financial sector which dropped another 7%. Other international developments included major declines in GDP in both the U.K. and China. South Korea saying maybe U.S. treasuries were no longer a buy helped put pressure on our bond market. News was mixed in the tech sector though it tilted mostly negative. Apple beat, Google did well but investors focused on Microsoft who missed expectations, withdrew all guidance and announced layoffs. A myriad of smaller tech companies did pretty much the same. In the world of economic reports the news continued to be grim. Housing starts fell to the lowest level since 1959. Every bottom in housing seems to be followed by a lower bottom. Initial jobless claims jumped up to 589K, higher than expected. After two light holiday weeks, it appears that companies have gone back to slashing payrolls. With all this going on, it's no wonder that the TradeRadar statistics are taking a more bearish stance. For those of you who saw the same chart in last week's post, you will see that all the indicators have declined even further for almost all the sectors. The only exception is the Energy sector which showed a little life this week as the price of oil perked up on Friday. It appears that SPY is at a crucial juncture here. The horizontal blue line indicates support-resistance. SPY has fallen below the line but recovered by end of week to just barely above. 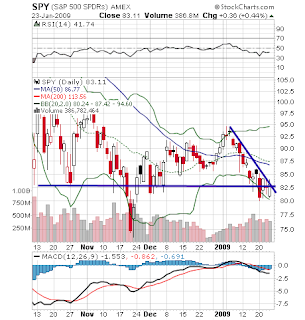 The blue downward sloping trend line is also in play. The decline in SPY has slowed and the price is now bumping up against this trend line. MACD is bearish but it is also slowing its descent. Failure to move above the levels indicated here could easily mean revisiting the lows established in November. The technical picture as described above ranges from outright bearish to "could go either way". What could provide the spark the would ignite a strong move upward? Probably the only impetus for a serious rally would be some kind of market-friendly announcement from Washington. In the meantime, stocks are due for a bounce and a few good earnings reports might do the trick and get the market moving for a few days. Still, the overall outlook is not positive for the near term. On the economic front, there are a ton of reports being released this week: existing home sales, leading indicators, consumer confidence, durable goods orders, new home sales, advance GDP for Q4-2008, Chicago PMI and Michigan consumer sentiment. None are expected to signal a significant turn for the better. Finally, we are in the thick of earnings season. With a bunch of banks already done reporting, perhaps this week won't suffer from the negativity that the financials always bring to the party.